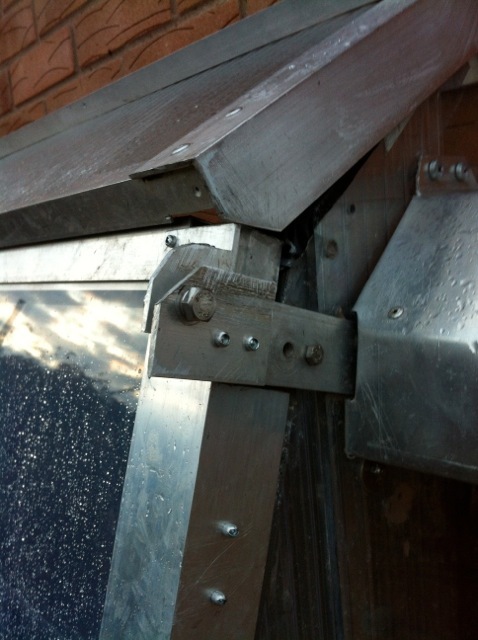 30 October 2012: The inner frame of the ETFE panels have 30mm square welded aluminium frames and the previous polycarbonate had a 16mm thickness. The front panels are 'fatter', so the hinge detail needs permanent modification. (this means I won't be able to re-use the old polycarbonate panels as a replacement should these get damaged or something). As I do not have a helper, I had to make a temporary cradle that would hold the fronts in position while I disconnect the old hinges. As my helper previously was called Bill, I wondered if I should call this 'Virtual Bill', but ended up calling it 'Brian'. 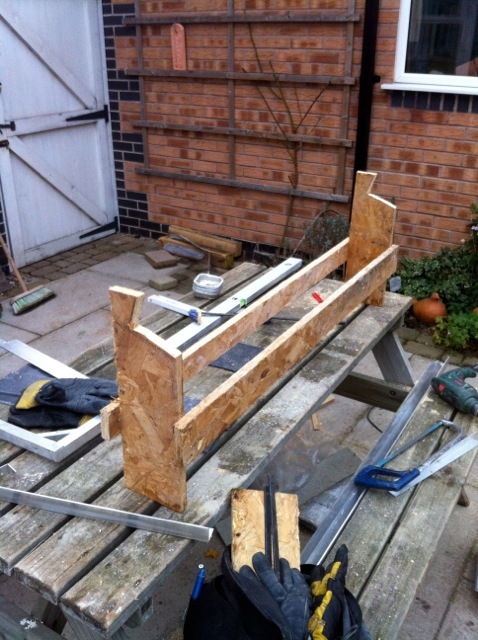 Brian is doing a great job supporting the panel fronts at the lower end, and the clamps ensure that the front is safe against gusts of wind while I work. Two hinge tops are in place and now the Sunbox front must be closed tightly so I can drill the 8mm holes for the M8 bolts to secure the hinge. Hinge is now completely safe. The frame is fatter, so it has forced the roof upwards and the finished roofline follows a slightly different angle. 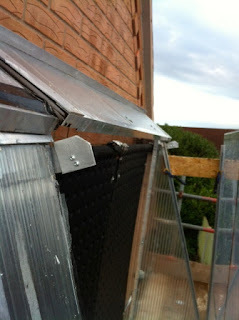 I have used a strip of compressible foam glued in to the gap to reduce air leakage. Next is the left hand panel, and Brian is helping again. 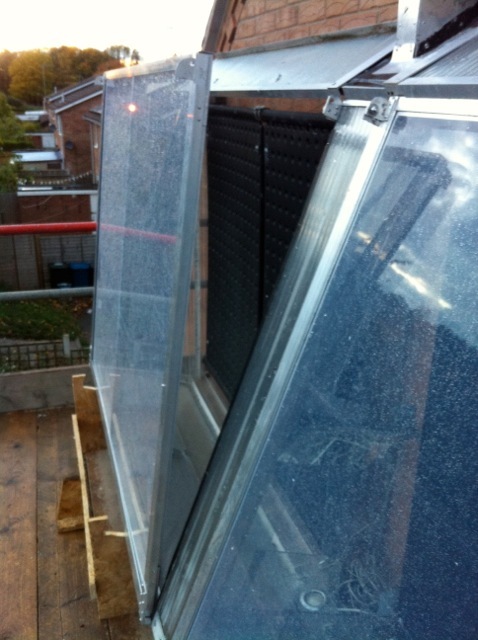 Both Sunboxes are now secure at the top. I need to complete some fixing at the bottom of the frames, and they will be complete. The scaffolding can't come down until the lower roof sunbox / panel goes on. 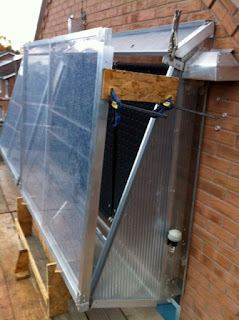 At the moment, I am keeping the old front panels, but later, as my confidence in the ETFE continues, I might re-cycle the aluminium from them for a future project. There's not much more to do on the fixing up now, I must just monitor the results for a few months. On the first full sunny morning of having these, I noticed that even with a washed out sun, they were delivering over 2 kilowatts. Let's hope this continues. You might notice from these photos that I also removed the MIRRORs that have spent two years at the top part of the sunbox. 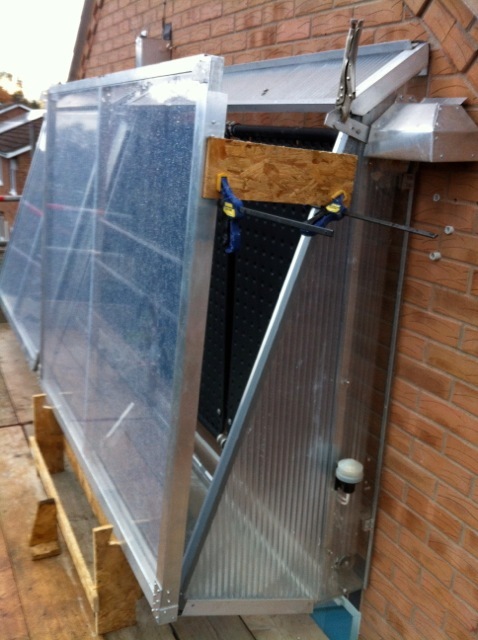 With the sunbox facing more directly toward the sun and receiving more direct thermal energy, the contribution from the mirror is not worth having. Leaving it up is a long term maintenance problem because the Mylar has to be replaced eventually. I have to submit a paper for CIBSE by the first week of December in which I shall make a preliminary report on this and other aspects of the work. Bear in mind that we are in the first winter quarter, but that is still quite a good test of the system.